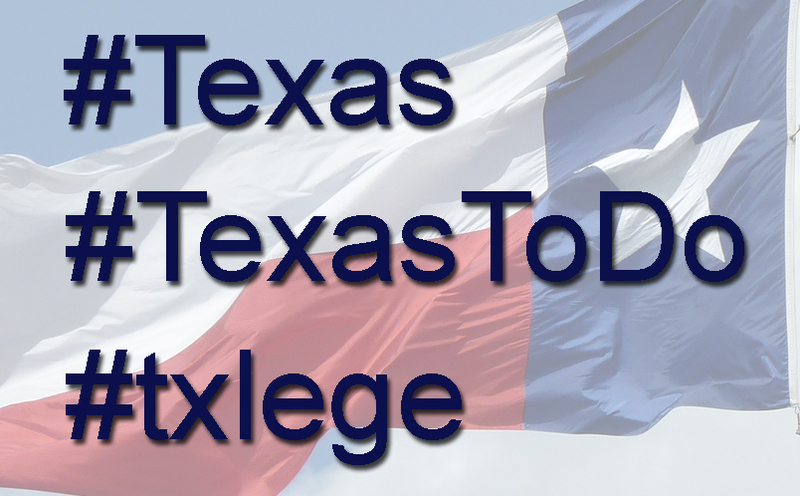 Official state hashtags of Texas; #Texas; #TexasToDo; #txlege. Background photo of Texas flag by ctj71081 on Flickr (use permitted with attribution / share alike). Texas Hashtags; [file:field-file-main-description] Photo by [file:field-file-photographer]/[file:field-file-source] ([file:field-file-license]). The Merriam-Webster Dictionary defines hashtag as; "a word or phrase preceded by the symbol # that classifies or categorizes the accompanying text (such as a tweet)." RESOLVED, That the 84th Legislature of the State of Texas hereby designate #Texas as the official hashtag of the state of Texas. RESOLVED, That the 84th Legislature of the State of Texas hereby designate #TexasToDo as the official state hashtag of Texas Tourism. RESOLVED, That the 84th Legislature of the State of Texas hereby designate #txlege as the official hashtag of the Texas Legislature.